Ideealistin makes a good point here in a follow up comment to a question posted by Lynn who had asked for some helpful ideas on toy storage. Everyone congratulate Felicity on a job well done. She shares her garage sale success story in this comment from Saturday. Here is a great refuse, reduce, reuse, recycle story shared by Ann in this comment. Well done Ann you have certainly undergone a full reform from your cluttering days. This comment from Carol certainly brings home the impact “hoarding” stuff can have on your children. The good news is it is never too late to turn this situation around. I really enjoyed this comment from Becky about her minimal Christmas. Like everything else this week, today’s five will have a holiday season theme. 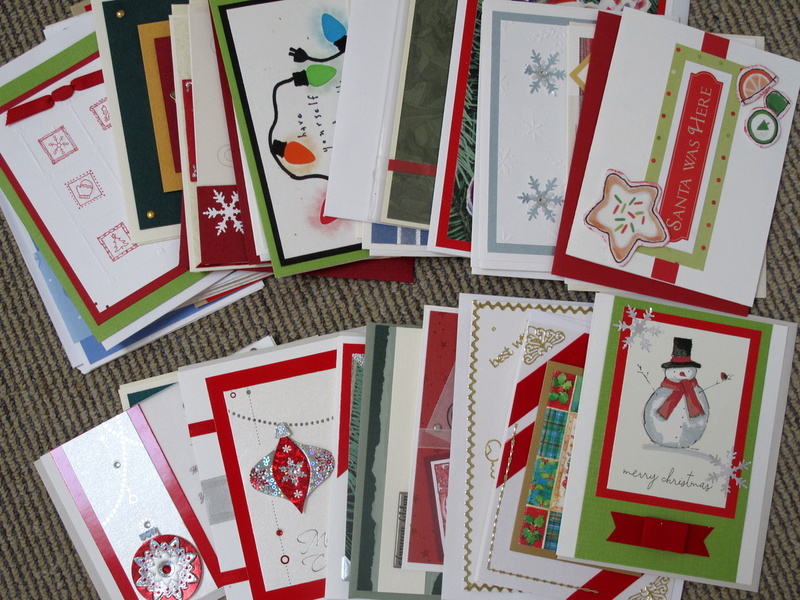 In keeping with today’s mini mission here are my recycled and/or handmade Christmas cards for the year. How is this decluttering you ask? I use the fronts of last years cards and a stash of card samples and craft supply that are cluttering up my craft room/office to construct this years cards. Once they are mailed that will be another small fraction of the overabundant craft supplies gone from my home for good. My new organic Christmas tree (pictures for you tomorrow), lunch with a good friend, more rain and getting a head start on next weeks posts so I have more time to spend with my parents while they are visiting. Thanks Dizzy for your contribution. One Christmas, many years ago, my mother got the idea from somewhere to have a tree branch hanging from the ceiling. It was similar to the tree branch in the photo. Dad screwed several little hooks into the ceiling and then hung the tree branch from the hooks. It had lights wrapped around the branch and decorations hanging from it. We had nowhere to put a traditional tree and this solved the problem. Afterwards I think it was chopped up and used for firewood by someone. It actually looked very magical. That sounds lovely and I am glad you liked it because tomorrow I reveal my new Christmas tree (or should I say Christmas branch). Honestly this is the first year that we are fully embracing a minimalist christmas, and i feel so enlightned by it. Good for you Sharron, it is nice to be able to discuss life with like minded people. Although I must admit I like being different and don’t care what other people think of that. I would like to see more and more people follow down this path though of being more consumer conscious and environmentally friendly. I would happily give up being different for that. I hope you enjoy your minimalist Christmas and we will pool our collective thoughts on how it went for everyone when the holidays are over. That should be interesting. Pay attention to other peoples reactions too because that will be interesting. My parents are visiting next week and I am dying to see their reaction to my “tree” which will be revealed tomorrow on Simple Saturday. I’m loving this also! I love Christmas and finding ways to make it fun beautiful and uncluttered all at once is so refreshing!! I have been inspired by some of your posts and links to do something for gifts I was considering and had not remembered. Our children are getting old enough to play more of our board games my husband and I like to play and have had for years. A few were boxed up in a closet, and we are wrapping them up for Christmas gifts for the children. They will love it! We will too! And we will give them one new thing, pjs and clothes they need too. I’m so looking forward to not having stacks of stuff to figure out what to do with after Christmas. We have been bagging up tons of toys and books and donating them each week along with you. I even just gave away an extra set of dishes because if we ever really need more we can get them. We don’t need more right now! Thank you for being SO INSPIRING! 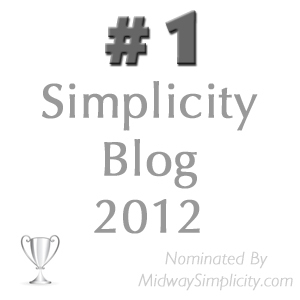 No minimal or uncluttered blog has inspired me to action as much as yours. Others made me feel dreamy and inspired, but you have gotten me to act on more of my daydreams. Thanks so much! What a lovely comment, thank you Angela. I always loved playing board games with my kids and I am sure you will have lots of fun sharing those games with your children. I love it that your husband enjoys it too, mine wasn’t so keen. My kids are grown now but we still have fun with board games when there is a crowd like when we visit family for Christmas. I think my husband’s sister’s kids think I am the crazy games aunt, and that is fine by me. I am so glad that you have found in my blog the inspiration that has been lacking for you in others. I think it is the down to earth honest approach and the great community that has established itself here. I am constantly inspired myself by the comments that my readers send in. A great symbiotic relationship I think. Good for you Angela. There is nothing like a worth while challenge to make life interesting especially when it is to the benefit of a healthy environment and a decluttered home. I’m well on the way to my minimalist Christmas tree, chopped a branch of a tree last night, painted it gold, now just need to visit the op shop/dump to find a suitable pot for it, and it will be time to start the decorating, which should take, oh about 3 minutes! Alright Judy! Please send me a photo of your tree/branch. I will send you my email address. You will get to see mine tomorrow so stay tuned. Well the minimalist tree is up, hubs thinks it looks a bit sparse but he’s such a nice guy he’s happy to go along with it! Will send the photo through tomorrow to you. Can’t wait to see yours! And it did take a bit more than 3 minutes. While I was at it, I decluttered a bag of Christmas bits and pieces, put out some treasured items that I’ve had for a long time, and messaged my daughter in law to see if she’d like the bag of goodies, if not in the garage sale it goes! Well done Judy, I am dying to see it. I am happy with mine and I had the perfect pot to put it in. The plant that usually resides in it is having its first vacation outside. It is probably loving it because it is raining. It will probably come back inside with a new lease on life. My husband was just glad to see the big tree gone. I am glad you also managed to declutter some items while you were at it. All this talk of Christmas this week and I am now desparate to put our little tree up,lol. I shall try and hold firm til maybe 2 weeks before Christmas. I have been making a few tree decs this week from drift wood from the beach and beads I had from old creative projects. (We don’t have many decs as last year was the first time we had a tree). On the decluttering front, I have this week got rid of three large bags of grout, as I don’t think I’ll be doing any more mosaic grouting at home. Bye bye aspirational clutter! Also, I have spent 2 recent Saturdays helping a family member declutter their home office…oh my word..knee deep in chaotic clutter and not a square inch of floor space to be seen. It’s been a very positive experience though, and I think I am rather good at helping others declutter their stuff. I have been booked to help 2 other people now (non family). I have taken up a new ‘craft’hobby, but I am following the good principles I have learnt here and have resisted buying everything could want for it. I am just buying what I need for now. I am glad that all this talk of decluttering Christmas hasn’t dampened your spirit at all. Why hold back on the tree, if you want it up put it up now and enjoy it for longer. Well done getting rid of the aspirational clutter. And especially well done for helping your family member declutter their home office and for making plans to help others. How good are you!!!!!!! So what is the new craft? It must be refreshing to approach a new hobby with a strategy in hand not to clutter it up and turn it into aspirational clutter. Have fun with it. Well maybe I’ll put thre tree up sooner than planned, but not yet: mid November is just way too early for me,lol. I’m getting so much out of helping others declutter, you can see my further thoughts on this in my answer to Cindy below. I just find them so enchanting, funny, clever, magical, but have always felt they were technically beyond me – working out all the cams/crankshafts etc and making the parts for mechanical movement. But I saw some more on a recent ‘Honeymoon Mark Two’ weekend away and came back feeling more ‘I must give it a go’. I have now designed and made 2 very simple ones out of cardboard and have read two books on the technicalities (that I already owned but had never read). It feels like all the decluttering and made space in my head to try this now. I have scroll saw which is a lovely bit of kit that I have to collect from my parents – there is now space, due to decluttering, in what would ordinarily be a dining room in our house but we don’t need it as such, to cut out wood etc. In recent years I have been making clocks so I know I have some ability (not the clock mechanisms!). But automata will still be very difficult, but so far, I have found it fun, and that is all that matters. I am resisting any other kit or wood til I have used up what I have got and have proved this isn’t a flash in the pan. I do wish I have paid more attention to my brothers mechano sets when a child though, and picked up some basic understanding of how things work! That sounds like so much fun Katharine. I reckon I could have a good time with the scroll saw, boy’s toys they are so much more fun than girly stuff. Mind you when I went to look at the video you linked to I went further and eventually ended up here http://zenmagnets.com/ they looked like fun too. Fantastic job Katharine. You may be able to turn your decluttering expertise into a bit of money. What new craft did you take up? Thanks Cindy – I have found it so enjoyable and satisfying, and am getting good feedback that I am beginnining to think about the idea of ‘can I make this a little business’ so am doing some research. I will keep you posted! I trained as a Counsellor a decade ago and this certainly utilises those skills in a way I haven’t used them professionally since my qualifying hours,having decided one to one sessions in a room wasn’t my thing. I’ve answered the new craft question above to Colleen. Love the picture of the minimalist Christmas “tree”. I pinned that to one of my boards on Pinterest and have already had others repin. I would really enjoy something like that. Ah, Pinterest, I haven’t looked at that for a couple of weeks. I might have to go over there now and waste, well hopefully only 15 minutes or so. But how time flies when you are having fun. That “tree” was my inspiration to do the same. I love that minimalist Christmas tree/branch, and can’t wait to see yours, Colleen. I loved it too and after getting the approval of the men about the house I pulled down the huge fake pine one this morning. Actually both men said that didn’t care if there was no tree at all. I’m (fortunately?) not into the whole christmas thing yet. We volunteered for having a foreign student living with us for three months. It’s not fixed yet, but quite probably, we’ll have someone else living with us for the next weeks. That gave me another sting to declutter more – especially in those areas that don’t strike usual visitors but would bother a roommate. Our washing machine is in the “storage room”, so I’ll better get rid of some crap that is blocking the room there. However, I’m really happy to have her over, so I love decluttering further. That all sound wonderful Sanna. Sharing your home with someone from another country, and that being the inspiration to clear out a little. You are going to love Monday’s mini missions next week. Viewing your home through the eyes of a visitor is a totally different experience that just ambling through what is normal for you. When I look at home now I think, what would my readers think if this or that if they lobbed on my door step unannounced. Would they think ~ ‘My goodness I was expecting better than that.” and that motivates me to keep at it and to stay tidy. I admit I have always been a neat freak so keeping tidy isn’t much of a stretch for me. Enjoy your visitor and look out for Mondays missions. In my garage decluttering, a big stumbling block was the five tubs labeled ‘memorabilia’. I kept them for last, I dreaded opening them, fearful of the emotions that would be brought up, worried that I would find it too hard to throw anything away. My friend Deb came over to help me. We set a time, had a nice lunch, and then she sat next to me, talking me through it, offering encouragement, keeping me going. My goal was getting it down to two tubs. I made it to ONE! Best things about the experience: 1)It is so much easier when a friend is offering support. Must do that again! 2) Amazing how much junk was in there, that was EASY to toss. What was I thinking, saving it? 3)Only good memories are left in the box. 4)And, it is DONE. After years of delay, how good it feels to have tackled and completed this! You go girl! We are proud of you. It takes a lot of courage to do that and you were smart to get your friend to be there to support and encourage. Doesn’t it feel wonderful to have it done now? Such freedom!! That is wonderful Sabine -well done. I can feel the relief from here. And what a good idea to have a friend with you to lighten the burden. I also think sometimes having someone else there helps you see things from a ‘strangers’ perspective, even if they don’t say anything. WOW! Great effort and how clever to get moral support to guide you in what could have been a difficult task. I am curious for more details and have sent you a request to write a blog post for me about this momentous effort. Hi Colleen, rapt to make your favourite five – thanks again for the congratulations. I’m still on a bit of a decluttering “high” from the garage sale – was in Sydney this week and as l mentioned so much stuff in the shops. Glad l didn’t get sucked in to buying unnecessary things. Yes good for you, Felicity. Shopping is a lot easier to resist if you just avoid the shops in the first place. I don’t even like it when I have to buy something these days. It soothes my soul when the items lives up to my expectations though. And I have very high expectations. I have almost felt like scrooge this year since I don’t want to deal with the stress of the holidays. I have scaled back and am much happier. I used to do so much and spend so much. As long as we had the cash and didn’t use any credit I thought I was doing a great job. I bought too much and every Christmas I would look at the kid’s haul and feel like I did too much. This year I am spending 1/4 to 1/3 of what I usually spend. The older 3 kids are getting cash and I haven’t figured out what we are doing for the younger two yet. I just want our holidays to be more meaningful and focused on the real reason we have Christmas and focus on spending time with family and sharing with others we love and others who are in need. Last year, we didn’t buy buy the kids any gifts, but took them on a family trip. They loved it! They drew names and each child got 1 gift from a sibling. I was worried about how things would go, but they were so happy. We had a great time together and they are still talking about the memories from that trip. I wish we could just do that every Christmas, but it would be too expensive. We didn’t come back with lots of Christmas clutter, but only lots of great memories. Hi Spendwisemom, your last Christmas sounds perfect and I am sure this one will be equally special. I know how it feels to feel a bit like scrooge but it all tends to work out in the end and then you feel so good about doing the right thing. Most of the time the expectations of others exists only in our own minds. I love what you are doing and will post a link on my Favourite Five post either this Friday or the one after. Hopefully that will translate into more supplies for you if I have readers in your area. Thank you for teaching your students not only to appreciate art but the appreciate and do the right thing for our planet.